"things to do in boston"
"Brad Shur", "Brer Rabbit Tales", "Childrens Theatre", "Magical Moonshine Theatre", "Puppet showplace theatre", "The Carrot Salesman", "brookline", "bunnies", "puppet show", "things to do in boston"
Kick off Easter weekend with the most infamous trickster rabbit of them all- Brer Rabbit! Not enough bunny for you? Not to worry! We have more bunnies through next week in "The Carrot Salesman" performed by Brad Shur, PST Artist-In-Residence! About the show: Brer Rabbit is more "April Fool's" than the Easter Bunny, but his antics are hopping great fun! In this hilarious show by Magical Moonshine Theatre (on tour from California! ), our famous floppy-eared trickster continually tries to outwit the likes of Brer Fox and Brer Bear. Magical Moonshiner Michael grew up in Alabama, listening to the tales of Brer Rabbit, filled with lore, wisdom and shenanigans. In Tales of Brer Rabbit he and wife, Valerie, blend together some of their favorite folktales, adding a little banjo music and singing to create a show that is clever fun for children and adults alike. "The Carrot Salesman" is the original story of a door-to-door carrot salesrabbit who is not very good at his job. But through his unsuccessful efforts to sell carrots to elephants, jellyfish, moles, and robots, he discovers a way to help all of the animals. 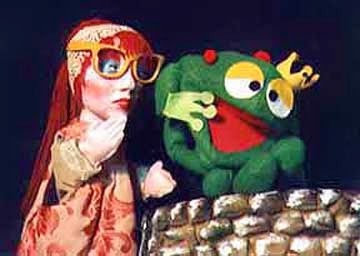 Performed with colorful two-dimensional table-top puppets and fun audience interaction. This show is recommended for ages 3 and up. The tale of the trickster Brer Rabbit originated in African Folklore and then carried on by African slaves in the New World. Once there it acquired attributes of similar Native American tricksters. The legend was popularized in the United Sates in the stories of Joel Chandler in the late 1800’s. The overall theme is a small, weak, but clever ingenious force can overcome a larger, stronger, but dull-witted power. Brer Rabbit continually outsmarts his bigger animal associates, Brer Fox, Brer Wolf, and Brer Bear. "Marionettes", "Puppet showplace theatre", "Tanglewood Marionettes", "aladdin", "arabian tale", "brookline", "children's theatre", "theatre", "things to do in boston"
Go on an Arabian Adventure! About the show: The adventure features over a dozen beautifully hand-crafted marionettes and exquisite “story-book” style scenery, “An Arabian Adventure” tells the tale of a Persian prince who is thrown into a dungeon because of his love for a beautiful princess. Facing danger at every turn, the courageous prince must battle his way out of the underground prison to save his princess from a tragic fate. The program is presented with the marionettists in full view, so that the audience can witness firsthand the mechanics of puppet manipulation. About the performer: Tanglewood Marionettes was founded in 1993 by Anne Ware and Peter Schaefer, Tanglewood Marionettes is a nationally touring marionette theater based in New England. There repertoire consists primarily of classic tales performed by skilled puppeteers who have spent many years perfecting their art. Perhaps you have seen them perform locally at places such as The Children’s Museum in Boston, The Yale Art Gallery or First Night, just to name a few. Marionettes are puppets that are manipulated by strings or rods. They are one of the oldest forms of puppets with their roots going back to ancient Egypt were they were created out of ivory, wire and wood or clay. In Rome ivory dolls that could be articulated through the use of rods from above have been found in tombs. Puppeteers in Sicily continue to use similar puppets to this day!